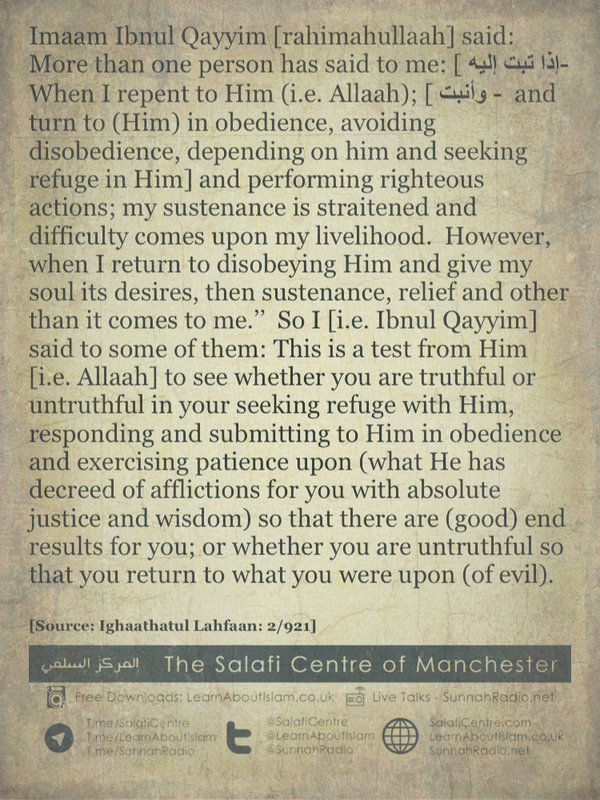 [ إذا تبت إليه–When I repent to Him (i.e. Allaah); [ وأنبت – and turn to (Him) in obedience, avoiding disobedience, depending on him and seeking refuge in Him] and performing righteous actions; my sustenance is straitened and difficulty comes upon my livelihood. However, when I return to disobeying Him and give my soul its desires, then sustenance, relief and other than it comes to me.’’ So I [i.e. Ibnul Qayyim] said to some of them: This is a test from Him [i.e. 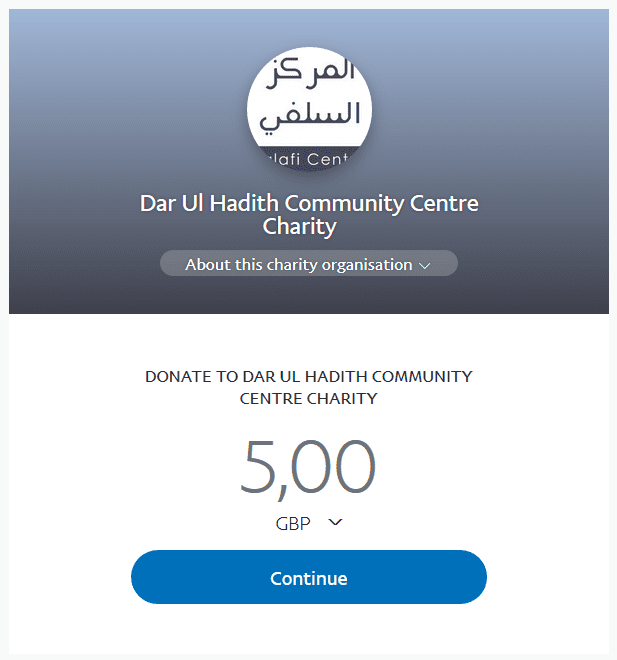 Allaah] to see whether you are truthful or untruthful in your seeking refuge with Him, responding and submitting to Him in obedience and exercising patience upon (what He has decreed of afflictions for you with absolute justice and wisdom) so that there are (good) end results for you; or whether you are untruthful so that you return to what you were upon (of evil). Saeed bin Jubayr said: Indeed reverential fear is that you fear Allah until it becomes a barrier between you and disobedience. 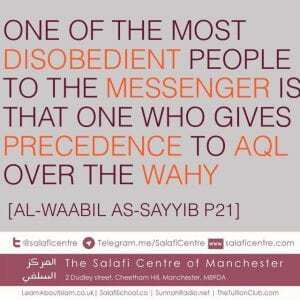 One of the most disobedient people to the Messenger (salAllahu alayhi wa salam) is one who gives precedence to the Aql over the Wahy. 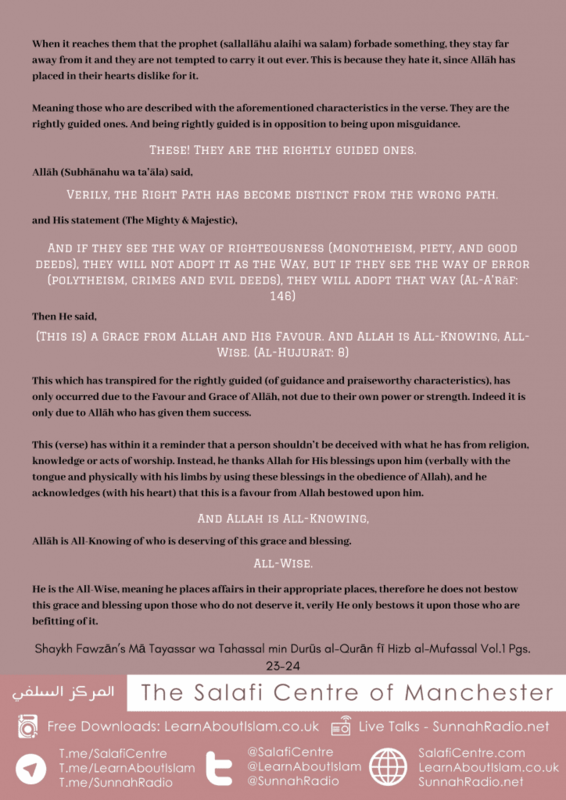 “It is a must that the Muslim reads (and contemplates over) the verses (of the Quraan) and Ahadith which describe Allah – Tabaaraka wa Ta’aala – with his attributes of perfection and nobility, for indeed this aids him upon the fear of Allah, and upon realising that Allah is ever watchful over all things; that Allah hears all that is to be heard, he hears all sounds and sees a black ant on a black rock in the pitch black of night. 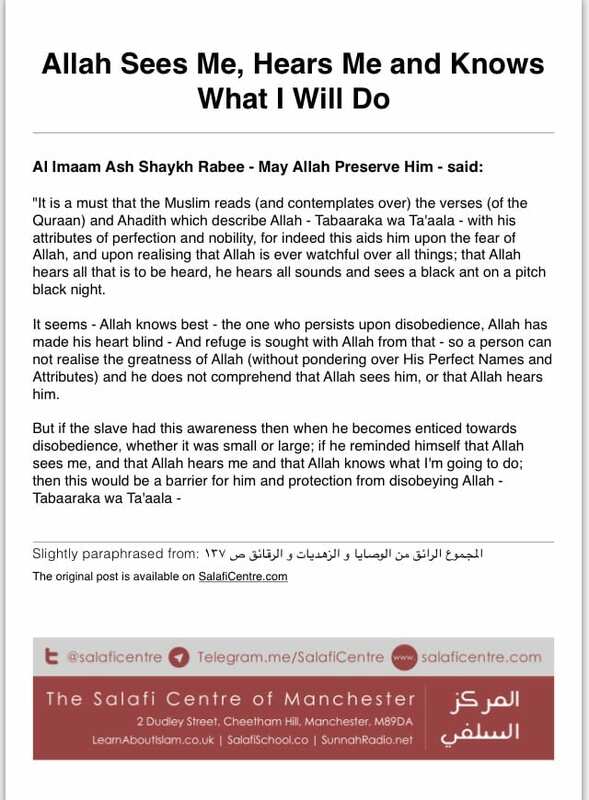 It seems – Allah knows best – the one who persists upon disobedience, Allah has made his heart blind – And refuge is sought with Allah from that – so a person can not (come close to) realise the greatness of Allah (without pondering over His Perfect Names and Attributes) and he can not comprehend that Allah sees him, or that Allah hears him. 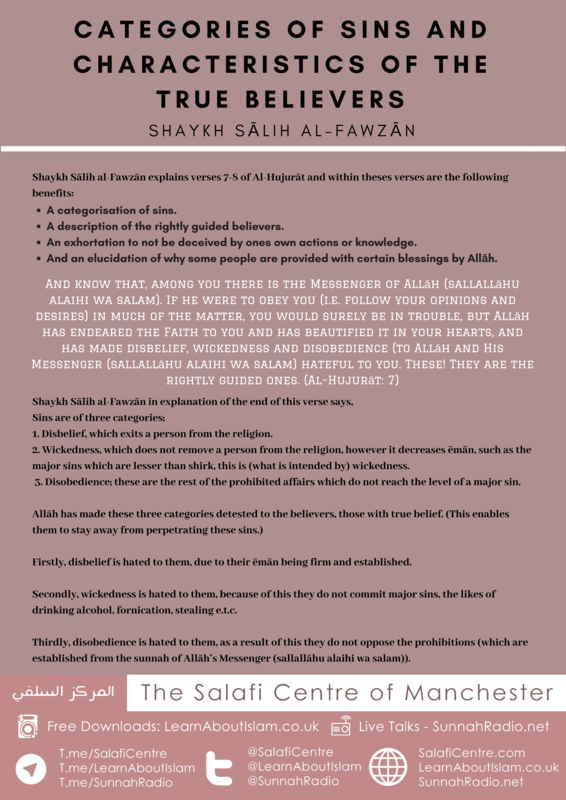 What is the proof from the Qur’aan that sins prevents (a person) from understanding the Qur’aan? [”Nay! But on their hearts is the Ran (covering of sins and evil deeds) which they used to earn.’’ [83:14] Shaykhul Islaam Ibn Taymiyyah (rahimahullaah) derived from this ayah that sin is a cause of not (being able) to understand the Qur’aan.